Spesiment Mauremys mutica kami diawet, dipamerkan di National Museum of Nature and Science, Tokyo, Jepun. ^ Fritz Uwe; Peter Havaš (2007). "Checklist of Chelonians of the World". Vertebrate Zoology. 57 (2): 231–232. ISSN 1864-5755. Diarkibkan daripada asal (PDF) pada 2010-12-17. Dicapai 29 May 2012. 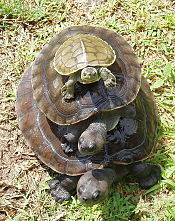 Asian Turtle Trade Working Group (2000). "Mauremys mutica". IUCN Red List of Threatened Species. Dicapai 27 January 2016. Cheung, S. M.; Dudgeon, D. (2006). "Quantifying the Asian turtle crisis: market surveys in southern China, 2000–2003". Aquatic Conservation: Marine and Freshwater Ecosystems. 16: 751–770. doi:10.1002/aqc.803. Ernst, C.H. ; Altenburg, R.G.M. ; Barbour, R.W. "Mauremys mutica". Turtles of the World. World Biodiversity Database. Dicapai 26 January 2016. Feldman, Chris R.; Parham, James F. (2004). "Molecular Systematics of Old World Stripe-Necked Turtles (Testudines: Mauremys)" (PDF). Asiatic Herpetological Research. 10: 28–37. Gong, Shi-Pin; Chow, Alex T.; Fong, Jonathan J.; Shi, Hai-Tao (2009). "The chelonian trade in the largest pet market in China: scale, scope and impact on turtle conservation". Oryx. 43: 213–216. doi:10.1017/S0030605308000902. Parham, James Ford; dll. (2001). "New Chinese turtles: endangered or invalid? A reassessment of two species using mitochondrial DNA, allozyme electrophoresis and known-locality specimens" (PDF). Animal Conservation. 4: 357–367. doi:10.1017/s1367943001001421. Rômulo, Nóbrega Alves; Washington, Silva Vieira; Gindomar, Santana (2008). "Reptiles used in traditional folk medicine: conservation implications". Biodiversity and Conservation. 17 (8): 2037–2049. doi:10.1007/s10531-007-9305-0. Shi, Haitao; Parham, James Ford (2000). "Preliminary Observations of a Large Turtle Farm in Hainan Province, People's Republic of China". Turtle and Tortoise Newsletter. 3: 4–6. Dicapai 27 January 2016. Yasukawa, Yuichirou; Ota, Hidetoshi; Iverson, John B. (1996). "Geographic Variation and Sexual Size Dimorphism in Mauremys mutica (Cantor, 1842) (Reptilia: Bataguridae), with Description of a New Subspecies from the Southern Ryukyus, Japan" (PDF). Zoological Science. 13: 303–317. doi:10.2108/zsj.13.303. "Asian yellow pond turtle (Mauremys mutica)". Wildscreen Arkive. Dicapai 26 January 2016. Laman ini diubah buat kali terakhir pada 13:44, 8 Mac 2018.